There’s so much to experience at Young’s! Your activities change with the seasons, and we’ve got you covered at Young’s. Golf, swimming, hiking & biking, skiing & snowshoeing, paddling & fishing, and more! Our All-Season Membership is a great choice for those who want to take full advantage of all the recreational opportunities and beauty Iron River has to offer. Choose from a family, 2 person, individual or college membership. This is the anchor location for Skiing and Showshoeing. Do Not Delete! 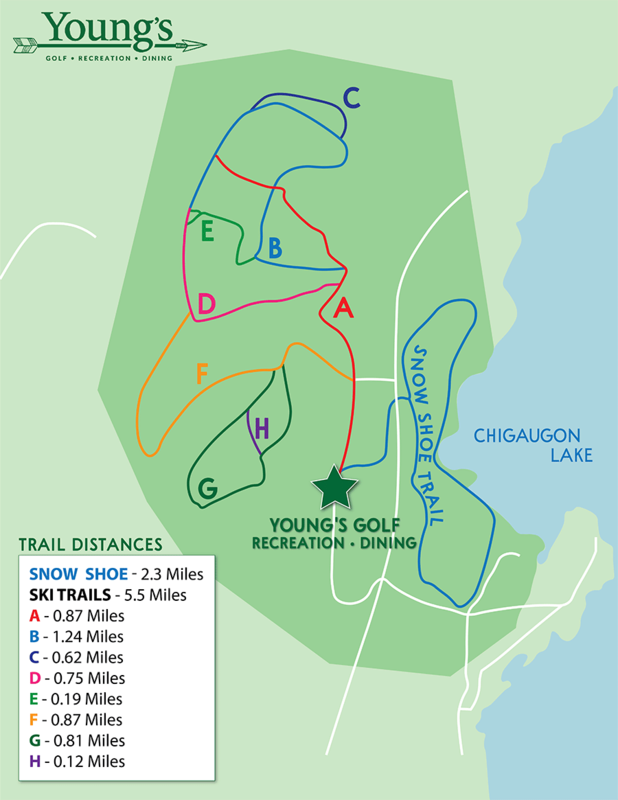 Take in the beauty of the Northwoods on Young's newly expanded cross-country ski and snowshoe trails! Explore the winter wonderland of Iron County on over 6 miles of professionally groomed trails. Afterwards, warm up with beverage and warm meal at FireBrick Bar & Grill or stop by the Aquatics Center for a dip in the Jacuzzi! We offer ski and snowshoe rentals for adults and complimentary ski and snowshoe rentals for kids. Please check in at the Pro Shop prior to using the trails. This is the anchor location for Snowmobiling. Do Not Delete! Upper Peninsula Michigan offers snowmobilers an exceptional combination of well-maintained trails, gorgeous winter scenery and wildlife you won’t find anywhere else in the Midwest. Iron County has over 250 miles of groomed snowmobile trails, along with cross-country and downhill skiing, sledding and snowshoeing. 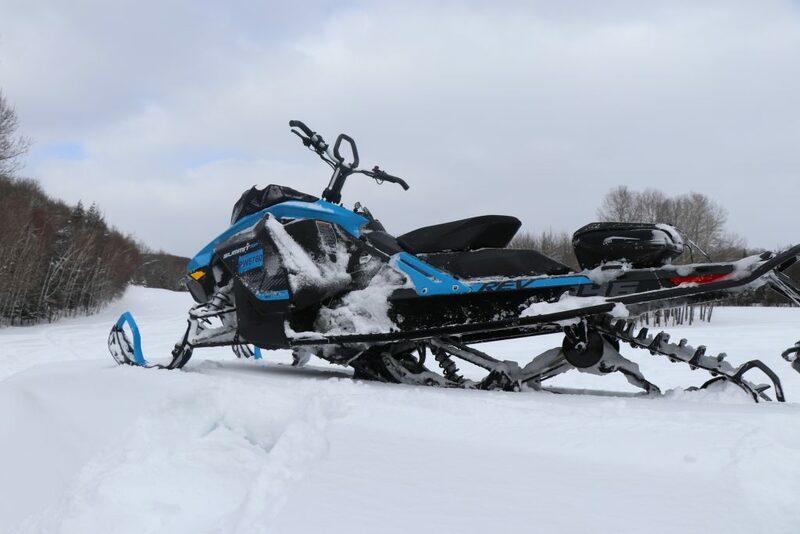 From Iron County snowmobile trails you can connect to trails in Baraga, Houghton and Dickinson Counties for endless winter adventure. Young's is conveniently located off trail 116 which connects to trails 16 and 2. We invite you to stop in for drinks and a great meal at the new FireBrick Bar & Grill! Have a little extra time? Purchase a day pass for the Young’s Aquatic Center and enjoy our indoor pool, jacuzzi and sauna. If a longer stay is in your plans, grab a room at one of our Iron River hotel partners, the Chicaugon Lake Inn just a mile down the road, or the Iron River AmericInn less than ten miles from Young’s. We’ll see you on the trails! This is the anchor location for Acquatics Center. Do Not Delete! 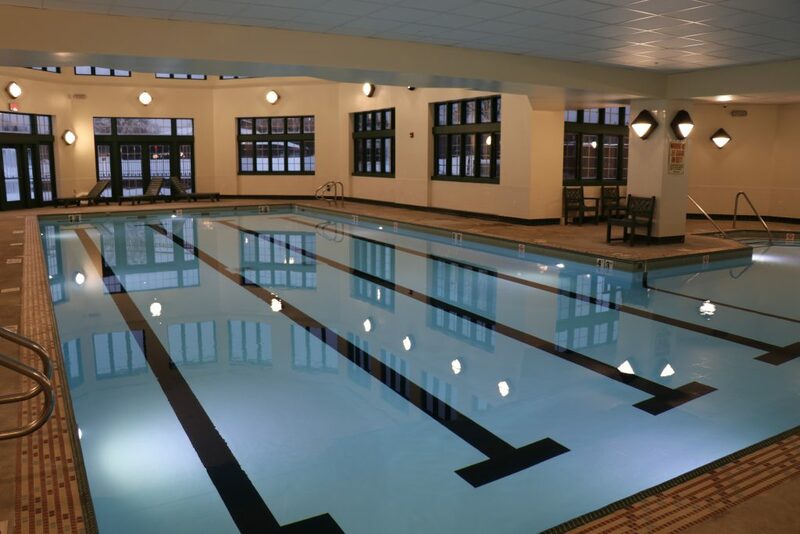 Whether you’re an Iron River resident or a visitor to Upper Michigan, our indoor Aquatics Center provides a great place for family fun and fitness. We offer day rates for vacationers, monthly rates for those with cabins, and year-round memberships for those who call Iron County home. Visit our Aquatics Center page for daily swim pass and membership rates! This is the anchor location for Hiking & Biking. Do Not Delete! Explore Young’s scenic woodlands on an easy hike of the 1.5-mile Wolf Track Nature Trail loop, or mountain bike several miles of Young’s scenic two-track roads. Follow us on Facebook for the latest news as we continue to expand and improve the Young’s trails. After your hike or ride, join us at the Clubhouse for drinks and a great meal at the FireBrick Bar & Grill. Join us in the wintertime for over 7 miles of Fat Bike trails. This is the anchor location for Fishing and Paddling. Do Not Delete! The Great Lakes and fishing are synonymous with Upper Michigan. Catch the evening meal while enjoying the beauty of the lakes and rivers scattered throughout Young’s. The quiet waters of Scott and Minnie Lake are perfect for exploring by canoe or kayak. Boaters can enjoy our two miles of shoreline on scenic Lake Chicaugon, where you can Dock n’ Dine for a great meal at the FireBrick Bar & Grill. The Young's pontoon boat is available to rent for $100 per day when available. Kick back and relax as you float around Chicaugon Lake. Please call 906-265-3401 and ask for our Lodging Coordinator or email jchild@experienceyoungs.com. Stay in the know! Sign up for the Young's Newsletter.